Spring is here, and that means it’s time to spring into style! The outdoors are beginning to look bright and colorful again, why not incorporate some of those colors in your home? 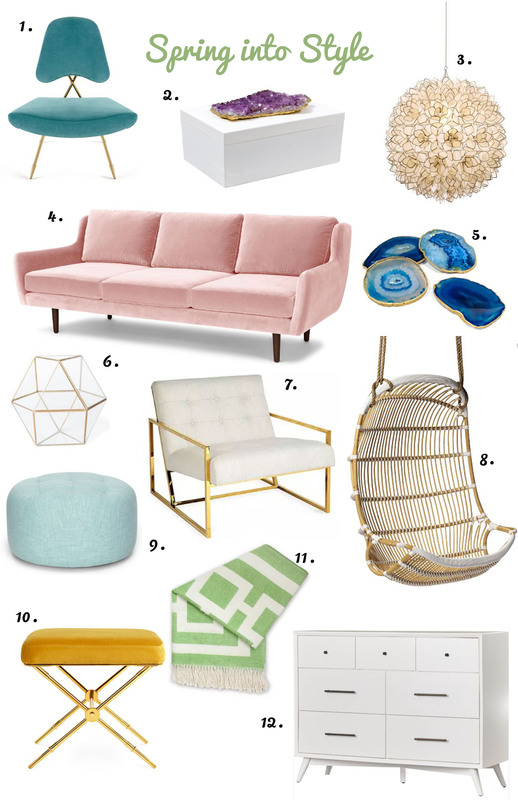 Take your spring cleaning to a new level this year and update your home with some of these fun and fresh pieces we’ve picked just for you. Maxime Lounge Chair, Jonathan Adler. This timelessly chic teal velvet lounge chair is the perfect pop of color for your home. This piece could be the finishing touch to your living room, or a fun addition to the lounging area in your bedroom. White Remote Lacquer Box With Amethyst, Mapleton Drive. We love this fanciful and functional lacquer box that can enhance any space. Another cool quality about this box is that every box is unique due to the use of natural materials. Capiz Shell Light Pendant, Neiman Marcus. Crafted of translucent capiz shell and silver-tone metal accents, this beautiful light fixture would go wonderfully over any dining room table. This piece can complete a fresh and flowery feel in your home this spring. Matrix Pink Sofa, Article. This friendly and welcoming sofa has lovely rounded proportions and tapered wooden legs. It’s beautiful compact design makes it ideal for smaller spaces, while its soft feel and fun color make it perfect for any home. Gold Rimmed Blue Agate Coasters, Mapleton Drive. Add some organic opulence and on-trend style to your desk, nightstand, or coffee table with these breathtaking agate coasters. This beautiful blue color gives off a fresh clean feel that is essential for enjoying spring. Angular Glass Terrarium Planter, All Modern. Nothing is better than how wonderful the greenery is in the spring. Glass terrariums are beautiful decorative pieces that can also bring a small bit of greenery inside your home. These pieces are easy to place and can match with any style of home. Goldfinger Chair, Jonathan Adler. This white and gold chair can be the perfect addition to any living room or bedroom. Its Ivory cushions matched with its gold frame create a chic and elegant feel, while still being playful enough to be paired with brighter colors. Double Hanging Rattan Chair, Serena & Lily. This hanging chair can be a statement piece, indoors or out, that will set a relaxed and homey feel in your space. Pair this chair with a comfy pillow or a cute blanket for a pop of color. Timpani, Article. We love this round ottoman. The Timpani’s graceful curves can bring shapeliness and a touch of color while also giving off a playful and welcoming feel to your living room or play room. Rider Bench, Jonathan Adler. This contemporary empire style bench can be a beautiful addition to your home. The royal feeling golden seat can function as a pop of color in your space while maintaining an elegant and eclectic feel. Green Nixon Throw, Neiman Marcus. Nothing says spring more than a fringed blanket. This hand loomed baby alpaca wool throw is a perfect spring accessory that will never go out of style. This fun color can be relevant all year long, so keep it out as long as you want. Sheehan Dresser, Joss and Main. This simple, yet chic dresser can add some light to your bedroom or guest room. This clean dresser can also be topped with an elegant mirror to create an instant vanity station. Interested in updating your home, but not sure where to start? We are here to help with some great ideas and know how to get you to that amazing home you’ve always wanted. Give us a shout.